I'm a big fan of Eurovision. I have all the Eurovision Song Contest DVDs that have been released, from the Eurovision 2004 contest right up to the latest one - the 2010 Eurovision Song Contest. But what makes this 2010 DVD so different from every other Eurovision Song Contest DVD released? Motion Quality. With the other ESC DVDs, from ESC 2004 to 2009 when the actual contest is playing back, the picture is updated 50 times a second. This means motion is as smooth, realistic and judder/flicker free as the PAL format is capable of - motion quality is just as good as the live broadcast. 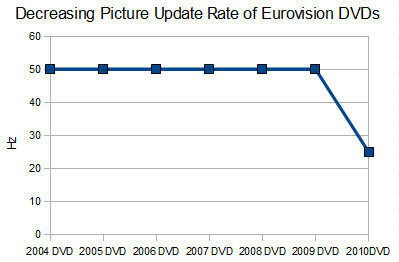 Now with the ESC 2010 DVD (except for the 2nd Semi Final), they've dropped the picture update rate down from 50 to only 25 times a second for the entire contest. What does this mean? It means the picture flickers/judders and everything is unrealistic - nothing like as good as the live broadcast or the previous DVDs. Eurovision 2010 (discs 1 & 3) - Picture updates only 25 times a second - picture is a flickery/juddery mess. I ask the EBU/CMC Entertainment or whoever was responsible for this release to please recall the current Eurovision Song Contest 2010 DVD and issue a replacement with proper video motion like all other Eurovision DVDs - not the flickery mess that the current release is. The video bitrate could also do with being increased since there are a lot of compression artefacts too.